The more I learn about skin and aging, the more horrifying the prospect, particularly the seemingly overnight collagen and hormonal loss that causes women's faces to collapse like rotting fruit. Not pretty. Diet can help, and skin experts are down on sugar but big on cruciferous and dark green veggies, salmon, blueberries, pomegranate juice, and now Goji juice. 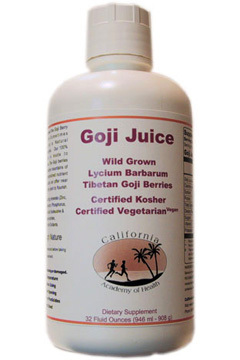 Goji, or Lycium barbarum, is a nutritionally dense berry that grows in Tibet. It contains B-complex vitamins, 19 amino acids, more vitamin C than oranges, vitamin E, more beta carotene than carrots, more protein than whole wheat and 21 trace materials. The juice isn't cheap -- $34.95 for a California Academy of Health 32-ounce bottle, available at Koolau Farms in City Square off Dillingham Boulevard -- but your supply, at a 1-ounce capful a day, should last a month. The Goji juice is mixed with organic apple and pear juice, so the end result tastes more like fruit punch than your typical health drink. As for the results, we'll see in 20 years. Or 200, if Tibetan lore is to be believed. Na Leo celebrates Mother's Day this weekend with two shows at the Sheraton Waikiki on Sunday. The doors of the Hawaii Ballroom open at 9 p.m. for a breakfast buffet and morning concert, but if your plans for Sunday also include going to church, you can catch them in the afternoon, when Na Leo and special guest Raiatea Helm return to the ballroom for a second show at 3 p.m. This is a big year for Na Leo. Angie, Lehua and Nalani are celebrating the start of their "second 20 (years)" in the record business, and all three say they're looking forward to celebrating their 40th birthdays. The trio is also celebrating the various stages of motherhood -- some of Angie's kids are preparing for college, Nalani has tweens, and Lehua is anticipating the birth of her third in the next few weeks. Admission to the morning show is $48 for everyone 12 and older, kids 4 to11 get in for half price and kids under 4, who don't eat much, are free. The afternoon concert is $27 for 12 and older, and $14 for kids 4 to 11. Lanai and Augie will emcee both shows.